This is a traditional and famous dish from Naples. Its rather controversial name (derived from Italian, word puttana meaning wh*re) has intrigued many over decades, yet there is no single explanation to its origins. Many versions and legends exist, although the most widespread of all is the folk belief that it was the dish invented, and often prepared by the Naples harlots in the early 20th century. 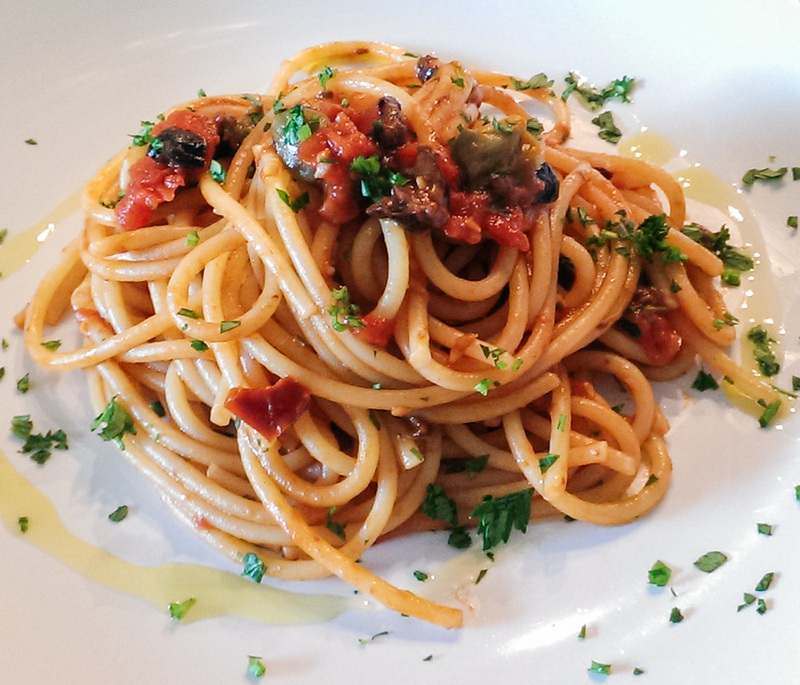 The sauce was a quick and easy pasta sauce for the puttanas to make in between customers, hence the name Puttanesca. Regardless its origins, we are talking about a very tangy and vibrant sauce. Even the recipe for this very famous dish exists in just as many varieties. For me however, the original puttanesca sauce will always be the one prepared by a famous Italian actor, Nino Manfredi, in just as famous Italian film 'Spaghetti House'. Here it is then. Once the sauce is on, pour at least 1 liter of water in a stock pot and bring to boil. Once boiling add a scant handful of coarse salt and throw in the spaghetti. Very important: strictly follow cooking time written on the package, as pasta has to be al dente!! When spaghetti are done, drain the water well and toss them with the sauce in the pan on low heat for 1-2 minutes (just in time for the pasta to absorb the sauce well). Serve immediately with a sprinkle of fresh parsley and a drizzle of olive oil.